Posted December 19, 2018 by Alannah Maher & filed under Arts & Entertainment, Theatre & Performance. Prada’s Priscilla’s are here to make the Yuletide gay with a truly unique Christmas Revue hosted by the six-foot something songstress herself, Prada Clutch. Prada’s gang have toured the country entertaining audiences everywhere from metropolitan cities to drought-stricken rural towns, exposing people to everything from the famous Les Girls of Kings Cross to a cross-country trip with Priscilla Queen of the Desert – to the surprise and delight of husbands and boyfriends who’ve been dragged in along the way. Prada brings a polished professional edge to her shows and an all-inclusive vibe that welcomes many audience members who’d be otherwise uninitiated to the drag world. Under the eye of producer and original Les Girl Monique Kelly, Prada also promises an authentic adventure into the foundations of Aussie drag. 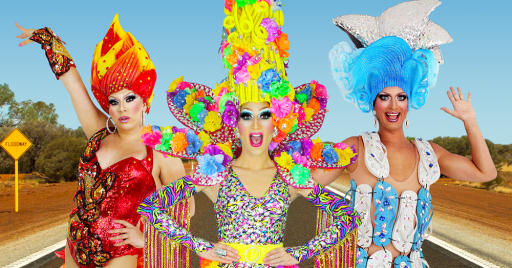 A pack of the country’s most talented drag queens (and dancers) serving up Christmas camp by the bucketload, accompanied by an Australiana themed educational experience (sure to spice up your dinner table trivia) and tributes to the biggest divas in the game – how could it get better than this? Carols in the Domain? I don’t know her.